The British Expeditionary Force or BEF was the force sent to the Western Front during World War I. Planning for a British Expeditionary Force began with the Haldane reforms of the British Army carried out by the Secretary of State for War Richard Haldane following the Second Boer War (1899-1902). The term "British Expeditionary Force" is often used to refer only to the forces present in France prior to the end of the First Battle of Ypres on 22 November 1914. By the end of 1914-after the battles of Mons, the Le Cateau, the Aisne and Ypres-the old regular British army had been wiped out, although it managed to stop the German advance. An alternative endpoint of the BEF was 26 December 1914, when it was divided into the First and Second Armies (a third, fourth and fifth being created later in the war). B.E.F. remained the official name of the British Army in France and Flanders throughout the First World War. German Emperor Kaiser Wilhelm, who was famously dismissive of the BEF, reportedly issued an order on 19 August 1914 to "exterminate...the treacherous English and walk over General French's contemptible little army". Hence, in later years, the survivors of the regular army dubbed themselves "The Old Contemptibles". No evidence of any such order being issued by the Kaiser has ever been found, it was likely a British propaganda invention, albeit one often repeated as fact. Under the terms of the Entente Cordiale, the British Army's role in a European war was to embark soldiers of the British Expeditionary Force, which consisted of six infantry divisions and five cavalry brigades that were arranged into the I Corps and the II Corps. In October 1914, the 7th Division arrived in France, forming the basis of the III Corps and the cavalry had grown to form the Cavalry Corps of three divisions. 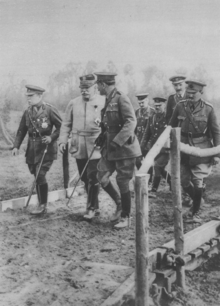 By December 1914, the BEF had expanded to such an extent that the First Army and the Second Army were formed. By the end of 1914, after the battles of Mons, Le Cateau, the Aisne and Ypres, the old regular British Army had been wiped out but had managed to help stop the German advance. The force was commanded by Field Marshal Sir John French until December 1915, when he was replaced by General Sir Douglas Haig. The BEF's Chief of Staff on mobilisation was General Archibald Murray. He was replaced in January 1915 by General William Robertson.. Lieutenant-General Launcelot Kiggell then served as Chief of Staff from December 1915, to the Armistice. The two initial Army Corps were commanded by Douglas Haig (I Corps) and Horace Smith-Dorrien (II Corps). As the Regular Army's strength declined, the numbers were made up, first by the Territorial Force, then by volunteers from Field Marshal Kitchener's New Army. By the end of August 1914, he had raised six new divisions and by March 1915, the number of divisions had increased to 29. The Territorial Force was also expanded, raising second and third line battalions and forming eight new divisions, which supplemented its peacetime strength of 14 divisions. The Third Army was formed in July 1915 and with the influx of troops from Kitchener's volunteers and further reorganization, the Fourth Army and the Reserve Army, became the Fifth Army in 1916. The BEF grew from six divisions of British regular army and reserves in 1914, to encompass the British Empire's war effort on the Western front in 1918 and some of its allies. Over the course of the war 5,399,563 men served with the BEF, the maximum strength being 2,046,901 men. The Second Army was formed at the same time as the First Army on 26 December 1914. The first commander was Smith-Dorrien promoted from command of the II Corps. In May 1915, Smith-Dorien was sacked and replaced by General Herbert Plumer. Second Army served in France notably in the Ypres Salient, and later served in Italy between November 1917 and March 1918, then returned to France. The Third Army was formed in July 1915. The first commander being General Edmund Allenby promoted after commanding the Cavalry Corps and the V Corps. He was replaced after the battle of Arras in May 1917, by General Julian Byng. The Fourth Army was formed in February 1916, under the command of General Henry Rawlinson. Confusingly when the Second Army was sent to Italy Fourth Army was renumbered the Second Army and reverted back to being called Fourth Army when the Second Army returned to France in March 1918. 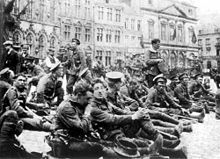 The British Army first engaged the German Army in the Battle of Mons in August 1914, which was part of the greater Battle of the Frontiers. The massed rifle fire of the professional British soldiers inflicted heavy casualties on the Germans who attacked en masse over terrain devoid of cover. The British held up the German advance until the evening when, they began retiring to a second defensive line in the retreat from Mons and the Battle of Le Cateau. The British victory at Le Cateau had achieved its objective, and enabled the BEF to retreat unmolested by the Germans for a further five days. The Allied retreat finally ended at the River Marne where they prepared to make a stand to defend Paris. This led to the First Battle of the Marne, which was fought from 5 to 10 September 1914. This battle would prove to be the major turning point of the war by denying the Germans an early victory. From the 13 September the First Battle of the Aisne took place with both sides starting to dig trenches and then for a three week period following the development of trench warfare, both sides gave up frontal assaults and began trying to encircle each other's flank. This period is called the Race to the Sea as the Germans aimed to turn the Allied left flank, and the Allies sought to turn the German right flank. Picture - The front line in 1916, British gains during the battle of the Somme are shaded blue. 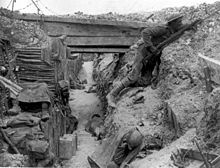 By the end of First Battle of Ypres, both sides started to dig in and Trench Warfare took over from the manoeuvre warfare that had taken place during the Race to the sea. The continuous trench lines of the Western Front now stretched 400 miles (640 km) from the North sea to the Alps. 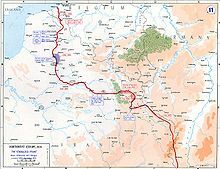 The British Army held a small portion of this 400 mile front from just north of the pre war Belgium border to the River Somme in France, varying in length from 20 miles (32 km) in 1914, to over 120 miles (190 km) in 1918, in the area commonly known as Flanders. From the end of 1914, and in 1915, the BEF attacks were centred around the Ypres Salient. 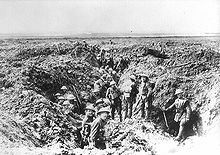 Then in September 1915, six divisions were involved in the Battle of Loos which is also notable for the first use of Poison gas by the British. In 1916, the BEF had moved into the Picardy region of France and the year is dominated by the Battle of the Somme. Allied forces attempted to break through the German lines along a 25 miles (40 km) front north and south of the River Somme in northern France. On the First day on the Somme the BEF, suffered 59,000 casualties. After the war a final tally showed that 419,654 British and 204,253 French were killed, wounded, or taken prisoner; of the 623,907 total casualties, 146,431 were either killed or missing. In 1917, the BEF's attacks moved along the front, they were in the Pas-de-Calais for the Battle of Arras. They then concentrated in Belgium for the Battle of Messines and the Battle of Passchendale and ended the year back in the Pas-de-Calais for the Battle of Cambrai. In the spring of 1918, the BEF came under attack in both Flanders and the Somme during the German Spring Offensive. The Second Battle of the Somme was the BEF response to the German attack. 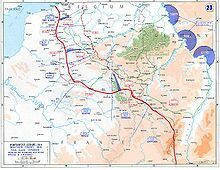 This in turn was the start of the Hundred Days Offensive, which lead to the eventual defeat of the German Army on the western front, after the First and Third armies broke through the Hindenburg Line at the Battle of the Canal du Nord. 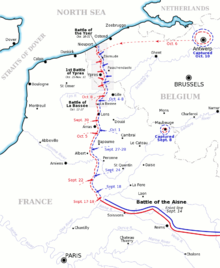 Which lead to the final battle of the war in November 1918, the Battle of the Sambre by the First, Third and Fourth Armies and the capture of Mons, 11 November 1918. by the First Army. 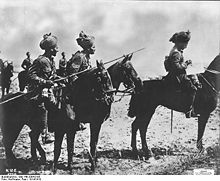 In September 1914, the BEF was reinforced by the Indian Expeditionary Force A which eventually formed two corps each of two divisions, the Indian Cavalry Corps and the Indian Infantry Corps. Upon arrival in Marseilles on 30 September 1914, only six weeks after the declaration of war, they were moved to the Ypres Salient and took part in the Battle of La Bass�e in October 1914. In March 1915, the 7th (Meerut) Division was chosen to lead the assault in the Battle of Neuve Chapelle. The Expeditionary Force was hampered by a lack of familiarity with new equipment, only being issued Lee Enfield rifles on their arrival in France and they had almost no artillery, relying on support from their neighbouring corps when in the front line. They were not accustomed to the continental weather and were poorly equipped to resist the cold, leading to low morale which was further compounded by the reserve system, whereby reinforcements were drafted in from any regiment and had no affiliation to their new units. Officer casualties were even more of a handicap, as replacements were unfamiliar with the Indian Army and could not speak the language. The infantry divisions were finally withdrawn to Egypt in October 1915, when they were replaced by the new British divisions of Kitchener's Army. The South African Overseas Expeditionary Force consisted of the 1st South African Infantry Brigade of four infantry battalions supported by five Heavy Artillery batteries, a Field Ambulance, a Royal Engineers Signal Company and a General Hospital under the command of Brigadier General Henry Lukin. The brigade arrived in France in April 1916, and was assigned to the 9th (Scottish) Division and took part in the Battle of the Somme in July 1916, and on 14 July the Battle of Delville Wood. Of the 3,153 men in the brigade only 750 where left when the brigade was relieved on 20 July. Later in 1917, the brigade took part in the Battle of Arras and in the Third Battle of Ypres (Passchendaele). The brigade was destroyed in the 1918, German spring offensive and by the end of the war had suffered 15,000 casualties 5,000 being killed. The Canadian Expeditionary Force was the designation of the field force created by Canada for service overseas in the First World War. Its major combat formation was the Canadian Corps, which eventually commanded four Canadian infantry divisions. The Canadian Corps first commander was General Edwin Alderson, who was succeeded by General Julian Byng in 1916, who was in turn succeeded in 1917, by the Canadian General Arthur Currie until the end of the war. After distinguishing themselves in battle from the Second Battle of Ypres, through the Somme and particularly in the Battle of Arras at Vimy Ridge in April 1917. The Canadian Corps came to be regarded as an exceptional force by both Allied and German military commanders. Since they were mostly untouched by the German offensive in the spring of 1918, the Canadians were ordered to spearhead the last campaigns of the War from the Battle of Amiens in August 1918. The New Zealand Expeditionary Force (NZEF) under the command of General Alexander Godley was the title of the military forces sent from New Zealand to fight for Britain during World War I. Upon the outbreak of war, New Zealand immediately offered to provide two brigades - one of infantry and one of mounted troops - a total of 8,500 men. The NZEF was closely tied to the AIF for much of the war. When the Gallipoli campaign began, the New Zealand contingent was insufficient to complete a division on their own so was combined with the 4th Australian Infantry Brigade to form the New Zealand and Australian Division. This division, along with the Australian 1st Division, formed the famous Australian and New Zealand Army Corps (ANZAC) under the command of General William Birdwood. After the end of the Gallipoli campaign, the NZEF formed its own infantry division; the New Zealand Division which served on the Western Front from April 1916. Taking part in the Battle of Flers-Courcelette, the Battle of Morval and the Battle of Le Transloy. 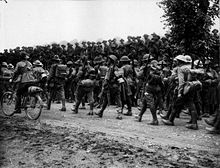 The Australian Imperial Force (AIF) was originally supposed to supply 20,000 men organised into one infantry division and one light horse brigade plus supporting units. By the end of the war, the AIF on the Western Front comprised five infantry divisions. The first Australians troops arrived in France in June 1915, the 1st Siege Artillery Brigade was formed under the command of Lieutenant Colonel Walter Adams Coxen, the Australian Army's Director of Artillery, for service on the Western Front. About half the men in the unit were permanent gunners of the Garrison Artillery. The brigade departed Melbourne for England on 17 July 1915 and landed in France on 27 February 1916. Its 54th Siege Battery was equipped with 8 inch howitzers and its 55th Siege Battery with 9.2 inch howitzers. Five infantry divisions of the AIF saw action on the Western Front in France and Belgium, leaving Egypt in March 1916. Initially they were organised into I Anzac Corps and II Anzac Corps alongside the New Zealand Division, however, on 1 November 1917 the Australian divisions were re-grouped together to form the Australian Corps. The 2nd Division was the first to arrive in France, followed by the 1st Division, while the 4th and 5th left Egypt later in June 1916. The 3rd Division was the last to arrive, having been formed in Australia in March 1916, and moving to England for training in July 1916, before being sent to France in December 1916. In 1916, the Commander of the AIF was General William Birdwood and when he was promoted Australian General John Monash was given command. Picture - Portuguese troops training with gas masks in the Western Front. Following a British Government call for Portuguese troops, on 7 August 1916 the Parliament of Portugal agreed the participation of the Portuguese Army on the Western Front. In addition to a heavy artillery corps of 1000 men under the command of the French Army, most of the Portuguese forces to be sent to the Western Front were to be incorporated in the CEP - Corpo Expedicionx�rio Portugux�s (Portuguese Expeditionary Corps) under British command. The CEP was organised as an army corps of two divisions and corps troops, totalling 55,000 men, under the command of General Tamagnini de Abreu. The first CEP troops arrived in France on 2 February 1917. The first troops reached the front on 4 April. On 4 June the 1st Infantry Brigade of the 1st Division repelled the first major attack made by the German Army against the lines defended by the CEP troops. On 5 November 1917 the CEP assumed the responsibility for an autonomous sector in the front, under the direct command of First Army. Most of the CEP was destroyed in the Battle of La Lys on 9 April 1918, losing more than 7000 men. From July 1918, the remaining men of the CEP participated in the final allied offensives under the command of Fifth Army. All other ranks in the BEF carried a .303 Lee Enfield rifle fitted with an easily loaded ten round magazine and issued with a 17 inches (430 mm) Bayonet. These rifles enabled a high rate of fire with good accuracy such that pre war British soldiers were trained to hit a target 15 times a minute at a range of 300 yards. The devastating fire power of the BEF infantry led the Germans to estimate that there were 28 machine guns in each battalion. 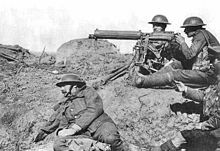 When the BEF landed in France each infantry battalion and cavalry regiment were equipped with two Vickers or Maxim machine guns. Part of the reason for only allocating two guns per unit was the cost to manufacture and the need of a ten week intensive training course for a Vickers gunner. As well as individual gallantry awards, all members of the BEF qualified for up to three campaign medals. The 1914 Star, the 1914-15 Star, the British War Medal and the Victory Medal. The 1914-1915 Star was issued to officers and men of British and Imperial forces who served in any theatre of the War between 5 August1914 and 31 December1915 (other than those who had already qualified for the 1914 Star). The British War Medal was issued to officers and men of British and Imperial forces who had rendered service between 5 August 1914 and 11 November 1918. Officers and men of the Royal Navy, Royal Marines, and Dominion and Colonial naval forces (including reserves) were required to have completed 28 days mobilised service - the medal was automatically awarded in the event of death on active service before the completion of this period. The Victory Medal was issued to all those who received the 1914 Star or the 1914-1915 Star, and to those who were awarded the British War Medal. It was never awarded singly. Women qualified for this and the earlier two medals, for service in nursing homes and other auxiliary forces. The British Army during World War I was the largest military force that Britain had put into the field up to that point. On the Western Front, the BEF ended the war as the strongest fighting force, more experienced and bigger than the American Army and with better morale than the French Army. The cost of victory was high. The official "final and corrected" casualty figures for the British Army, including the Territorial Force, were issued on 10 March 1921. The losses for the period between 4 August 1914, and 30 September 1919, included 573,507 "killed in action, died from wounds and died of other causes" and 254,176 missing (minus 154,308 released prisoners), for a net total of 673,375 dead and missing. Casualty figures also indicated that there were 1,643,469 wounded. Chandler, David (2003). The Oxford History of the British Army. Oxford paperbacks. 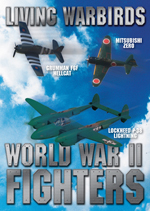 ISBN 0192803115. Chappell, Mike (2003). The British Army in World War I: The Western Front 1914-16. Osprey Publishing. ISBN 1841763993. Griffiths, William; Griess, Thomas (2003). The Great War. Square One Publishers. 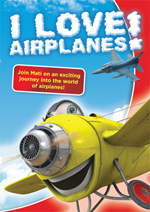 ISBN 0757001580. Jarymowycz, Roman; Starry, Donn (2008). Cavalry from Hoof to Track. Greenwood Publishing Group. p. 124. ISBN 0275987264. Meyer, G.J. (2006). A World Undone: The Story of the Great War, 1914 to 1918. Delacorte Press. ISBN 9780553803549. Sheffield, Gary (2003). 'The Somme'. Cassell. 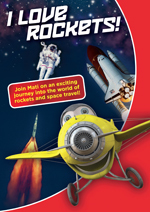 ISBN 0304366498. Sheffield, Gary; Pelger, Martin (2007). War on the Western Front. Osprey Publishing. 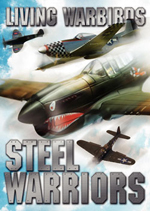 ISBN 1846032105. Sumner, Ian (2001). The Indian Army 1914-1947. Osprey Publishing. ISBN 1841761966. Tucker, Spencer; Roberts (2005). World War I: encyclopedia. ABC-CLIO. ISBN 1851094202.